Written by: Priya Potapragada on January 27, 2016. Chasia, just ten years old in 1942, became the only member from her family to survive the Holocaust. It took almost seventy years, but she was finally able to get some closure as she attended her mother’s grave site commemoration with her sons in 2011. The significant rituals that help millions with their grief were not an option for many families that lost their loved ones in the Holocaust until a Polish organization made it their mission to help. When Zbigniew Niziński — later to become the founder of Fundacja Pamięć, Która Trwa (The Lasting Memory Foundation) — began his journey in 1999 to trace the history of the Jewish people in Poland driven by a personal desire to understand, he found that an extensive part of this narrative was still in need of recognition – unidentified and unmarked graves of Holocaust victims. While traveling, he recorded testimonies from World War II and Holocaust survivors, and from Polish citizens who risked their lives in an effort to rescue and help Jewish people during the war. Niziński was so touched by their bravery and fighting spirit, he was compelled to do more. He decided to share these stories with the rest of the Polish community and, in an effort to honor the victims of the Holocaust, Niziński launched Fundacja Pamięć, Która Trwa in 2008. The Foundation aims to document the common history of the Polish and Jewish people, educate the Polish youth about the Holocaust and its survivors, and to identify and preserve the unmarked burial sites of the Holocaust victims. Since its inception, Fundacja Pamięć has helped identify and commemorate 50 mass graves in which more than 2,000 Holocaust victims lie buried. 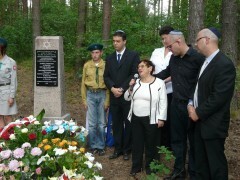 The Foundation played an important role in bringing together the local governments, The Righteous Among the Nations organization, and survivors along with its own volunteers in an effort to locate the unmarked mass graves in the wooded areas across the country. Fundacja Pamięć’s initiative was for many survivors the only hope to locate the remains of their loved ones and finally have a place where they can pay their respects. Looking to unite the community and instill empathy, the Foundation invites the municipal government authorities, clergy members, local and visiting students from Israel to take part in the memorial services commemorating the burial sites in the proximity of their community. Another meaningful contribution of Fundacja Pamięć to building a strong and empathetic community that does not forget history is their effort to help recognize families that risked their lives helping those persecuted in the Holocaust. As part of their preservation and recognition projects, the Foundation works on locating the surviving members of such families, helps sharing their stories and even arranges for financial support. Initiatives such as these help forge strong bonds as often both families, the ones helping and the ones needing shelter were found out and murdered during neighborhood searches. “Our actions help reverse the evil that took place many years ago. At the ceremonies, it is wonderful to see people talk about a need for sensitivity and empathy for the fate of every human being and actively oppose hatred towards others,” said Niziński in an interview with CAF America. Conduct educational seminars on the Holocaust and WWII survivors for the local schools and communities. “It is truly touching when you manage to identify the victims’ names. Then the graves stop being anonymous. The first and last names carry the memory of the victims’ lives and fate. Commemorating them means restoring their dignity.” said Niziński.